Four 6-inch Skeletons per garland. Use indoors or out... Wrap around a table, swag from windows or as decorative door toppers. Each Realistic Miniature Detailed NATURAL BONE-COLOR Skeleton is approx 6-inch (15cm) tall x 1.75-inch (4.38cm) wide. 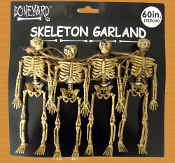 4-skeletons per jute twine garland. Use these skeleton decorated garlands to create the scariest Halloween house on the block! Hang over doorway, window, or drape from rail, bannister or ceiling. Great additions to cemetery, graveyard, dungeon, witches den, scientist lab, mad doctor office, pirate scene, etc. For decorative purposes only. REALISTIC SCARY, SPOOKY and GROSS... Fresh Decor from a Creepy Haunted House! Goes anywhere... Great to display in entry or hallway!